M/Y Annamia is a 43-meter mega yacht built in 2006 by the Italian shipyard Baglietto. This fully-equipped yacht is ideal for “family & friends holidays or special events charters” while making the most of the Mediterranean Sea. 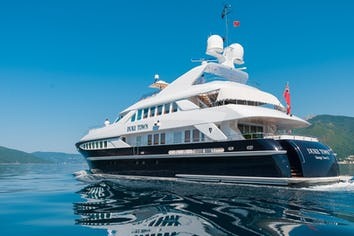 For the complete comfort and privacy of the passengers, the yacht is air-conditioned throughout and has 5 spacious suites with private bathrooms and separated audio-visual systems. Totally designed by Francesco Paszkowski, this triple deck yacht is recognizable by its metallic structures and its stylish grey hull with varying color reflections. At night, both the interior and exterior of the superyacht is embellished by the “L.E.D. changing color lights”. 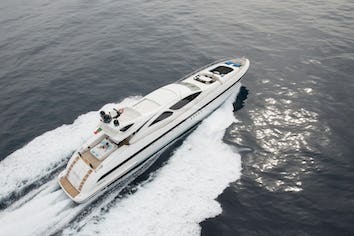 Organized in 4 levels, the motor yacht Annamia is beautifully proportioned to welcome up to 12 guests. On the main deck forward, a private access leads to the master cabin which offers a unique view. The stateroom includes a private bathroom with jacuzzi and hammam as also a dressing and an office. The aft deck dining area is perfect to enjoy breakfast while discussing the exciting plans for the day or to have a snack after doing water sports. Dedicated to the guests, the lower deck is arranged in 4 cabins which all have private bathrooms and separate audio-visual systems. There are two VIP cabins with double beds and two Twin cabins with two single beds and pullman berths. The upper deck is where you can admire the view from the high vantage point. It houses the sky lounge, a spacious area where charter guests can relax, watch TV or have a drink at the bar. Forward of the sky lounge, the guests can visit the captain’s wheelhouse which is equipped with the latest navigation and communication tools. When the yacht is docked in port, the bridge deck is appreciated for its privacy. This is the most frequented area because of the 180° sofa bench sheltered from the sun and the large “al fresco dining table”. The comfortable and roomy fly bridge is a great spot for sun lovers. The guests have sun beds and a large jacuzzi at disposal as also a dining table, a bench and a bar. The panoramic view from the sundeck is incredible as it is not obstructed by the superstructure. Also, a large sunshade and a wide white awning can be unfolded to protect from the midday sun heat if required. In the evening, the atmosphere on the sundeck can become quite different depending on the L.E.D. lights and sound chosen by the charter guests. 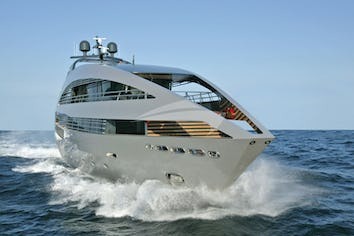 ANNAMIA can accommodate 12 guests in 5 cabins. The Master cabin has a queen size bed, shower and toilet. 2 Guest cabins have a queen size bed, shower and toilet. 2 Guest cabins have 2 single beds, a pullman, shower and toilet. ANNAMIA is fully air conditioned through out.